A cyst is an abnormal closed, hollow, and membranous sac filled with air, bodily fluids, keratin, and/or pus if the cyst has ever been infected. There are many different kinds of cysts, almost all of which are benign and do not require medical intervention unless they rupture, become infected, are very large, or are painful. Cysts are not limited to the skin and can appear on or in many of the body’s organs, though only cysts that can be found or treated by a dermatologist are discussed below. The term sebaceous cyst is a misnomer because it is used as a general term to describe epidermoid and pilar cysts, which are filled with keratin as opposed to true sebaceous cysts which are filled with sebaceous fluid. True sebaceous cysts (steatocystomas) are rare and linked with a genetic condition called Steatocystoma multiplex. Epidermoid cysts are caused when the cells that form the outermost layer of the skin move deeper, usually as the result of a damaged oil gland, hair follicle, or other trauma such as piercing the ear. They are most common on the face, arms, and truck. Pilar or trichilemmal cysts are similar to epidermoid cysts in that they both are filled with keratin and have the same presentation. However, pilar cysts are formed from the lining of a hair follicle and are most common on the scalp. Epidermoid and pilar cysts typically have no symptoms and require no treatment but can be painful or become infected. In such cases your dermatologist can excise the cyst. Reoccurrence is common. Severe cases of acne involve cysts filled with oil and dead skin cells that are formed when the contents of a comedone (pimple) penetrate deeper into the skin. They are more common in women and can appear on the face, shoulders, chest, and back. These lesions persist much longer than non-cystic acne and are more likely to leave scars. Over-the-counter treatments are unlikely to have any effect on cystic acne, which require more aggressive treatments including oral antibiotics, hormone treatments in women, prescription strength retinoids, or isotretinoin. Consult with your dermatologist if you think you have cystic acne. A chalazion is a cyst that forms on the eyelid as a result of a blocked meibomian gland, which usually secretes an oily fluid onto the eye to keep it moist. Most are not painful, disappear on their own over the course of a few months, and require no medical attention unless they become infected. Chalazia that reoccur or persist can be treated by surgical excision performed by an ophthalmologist. This type of cyst is most common in children and is the result of a persistent thyroglossal duct. The thyroglossal duct is a normal embryonic structure that closes as the embryo develops. A persistent thyroglossal duct is usually benign, but the cells of the duct continue to secrete fluid which can result in the formation of a cyst. This cyst can cause problems with swallowing, breathing, it can rupture, it can become infected, and it can very rarely become cancerous. This cyst is removed by a sistrunck procedure, a surgery that can is usually performed by an otolaryngologist. A pilonidal cyst almost always forms near the top of the cleft of the buttocks and is thought to be caused by an ingrown hair. This cyst can have no symptoms, but commonly become infected and very painful. These cysts can be excised by your dermatologist. 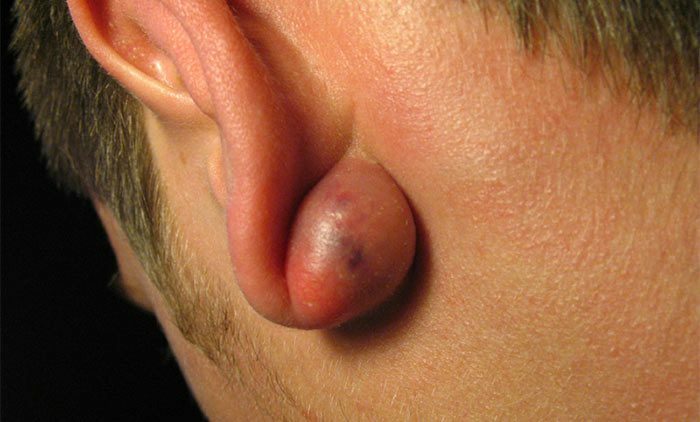 People who spend a large portion of their day sitting, such as truck drivers, are more likely to develop this cyst.